Kampala — The United Nations High Commissioner for Refugees (UNHCR) has said it is in talks with the government about recovering some of the funds meant for humanitarian relief operations. The recovery process is part of the accountability measures UNHCR and government are mulling to restore donor confidence following months of bad publicity of mismanagement of refugee operations by aid agencies and government officials. This was reinforced last week by an audit report by the UN Office of Internal Oversight (OIOS) which detailed squandering of money meant for refugee operations. UNHCR said in a statement issued on Monday that they have established a high-level dialogue with the Office of the Prime Minister (OPM) and other authorities on the audit findings, including recovery of funds. "Fuel cards and vehicle tracking have been introduced for implementation in 2019. A task force has been set up to review projects implemented by the Office of the Prime Minister. A preliminary report is due in mid-December," the statement read in part. The statement indicated that the audit recommendations in relation to partnership management, performance monitoring, procurement procedures, non-food item distribution and warehouse management are being addressed and toughened. Measures have been put in place, including with partner organisations and OPM, where these activities are jointly implemented, and "progress will be reviewed regularly." The Daily Monitor early this year lifted the lid on the mishandling of refugee operations by aid agencies led by UNHCR and OPM officials. The irregularities include creation of ghost refugees, misappropriation of funds and food aid, refugees being required to pay bribes in order to get screened and allegations that scholarships meant for refugees are instead going to Ugandans. The tip of the iceberg followed a spot on check in Kampala; when the more than 26,000 refugees, who were purportedly receiving provisions were asked to physically turn up and collect their share, only about 7,000 showed up, suggesting that about 19,000 were "ghosts". The scam prompted a visit by the UNHCR chief, Mr Filippo Grandi, on January 30. Mr Grandi's visit culminated in investigations and eventual suspension of senior officials in OPM. The report of UN investigators issued last week unearthed multiple areas of mismanagement including questionable payments worth Shs28b to track and bus companies, a Shs29b ($7.9m) contract for road repairs awarded to a contractor with no experience in road construction, and a stockpile of idle goods including 288,000 blankets and 50,000 wheelbarrows; 15,000 solar lamps worth Shs1b which went missing with no proper investigations done. The audit revealed that UNHCR's expenditure in Uganda skyrocketed from Shs462b in 2016 to Shs758b in 2017, with Britain, European Union, Germany, and the United States contributing 80 per cent of the funds. 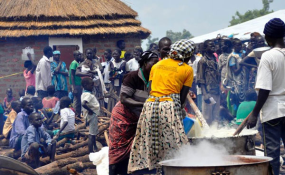 Uganda with a refugee population of 1.4m-- ranked as the second-largest refugee hosting country in the world after Turkey--had for a while basked in the adulation of the international community for having a progressive refugee policy but the irregularities has upset the donor community.